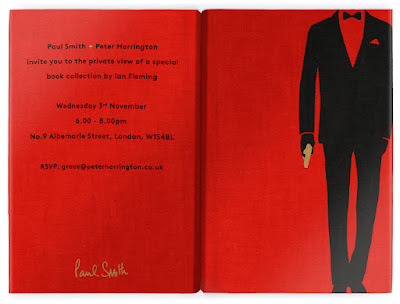 Special book dealer PETER HARRINGTON is having a SPECTRE party on November 3. Peter Harrington is famous for having many first editions and special books in their shop. 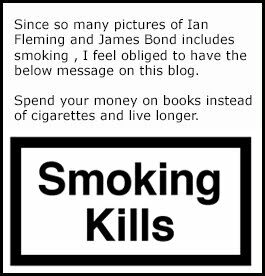 I myself have never been to the shop in person but I have ordered at least one Fleming book and am planing a visit in December when I am going to London. As you might be aware the James Bond perfume fragrance that is on sale now is from Paul Smith and this party is a collaboration between Paul Smith and the Peter Harrington bookshop. Following the release of highly anticipated Bond film SPECTRE, guests will be invited to browse Paul Smith menswear, alongside Fleming first editions and ephemera, all available to purchase on the night. Complementary nibbles and martinis will be served from 6pm-8pm. I myself cant attend this event since I live in Sweden but if you are a collector of Ian Fleming books and live nearby I suggest that you contact them and ask them if you can be on the invitation list. Best of luck but do not buy anything I intend to buy in December. In an earlier blog post I recommended you all to check out the BBC Shortlist documentary on Bond that was broadcast the other day. This link did not work for people living outside of the UK. Now the same program has been uploaded to Youtube. You can check it out below. Thanks to Niclas for the heads up!